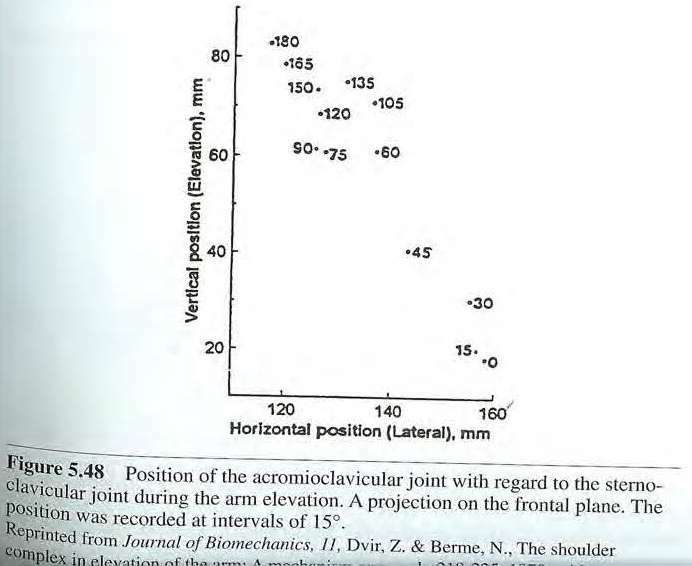 Much of the following description of shoulder kinematics is taken from Zatsiorsky’s Kinematics of Human Motion as he provides an excellent description and review of this very complex topic. Describing kinematics of the shoulder mechanism is not a trivial problem. Usually, articular motion of a distal body segment is defined with regard to the adjacent proximal segment, which is considered fixed. For example, the shank movement in the knee joint is analyzed with regard to the femur. In the shoulder complex, however, the scapula and clavicle are not fixed with the torso; rather they displace underneath the skin during movement. Thus, their orientation is hard to measure, their anatomic position is not well defined, and their relative positions are different for different people. Also, the principal joint movements, such as flexion-extension and abduction-adduction, are not defined for these bones. All of these issues make studying the shoulder complex kinematics very difficult. To avoid these obstacles, many investigators disregard the motion of the scapula and limit the study to the movement of the humerus with regards to the trunk or thorax. When discussing shoulder kinematics, the shoulder bone will often be defined with regard to the thorax rather than with relative to a proximal bone. When reviewing literature values, it is important to know whether the joint kinematics are calculated relative to a more proximal bone forming the joint or the movement is measured relative to another reference frame, anchored either to the trunk or to the axial skeleton. When considering glenohumeral joint kinematics, the motion of the humerus is measured with respect to the glenoid fossa of the scapula. The glenohumeral joint has 3 rotational DOF – flexion/extension, abduction/adduction, and internal/external (or medial/lateral) rotation. The glenohumeral joint surfaces are very close to spherical and the mating joint surfaces are quite congruent and have radii within a 3 mm difference. Because the joint surfaces are spherical and in congruence, the joint kinematics are essentially rotational and the surface-on-surface motion is mainly gliding. During arm elevation, the center of the humeral head is approximately at the same place and the surface of the humeral head glides downward on the surface of the glenoid fossa. The amount of displacement of the ICR can be considered to be negligibly small. As such, the glenohumeral articulation is typically modeled as a ball-and-socket joint. However, the radii of curvature of the glenoid and the humeral head are not completely identical. This is especially true if the cartilage is neglected and only the bony curvatures are compared. The ratio of the radii of curvature of the matching humeral head to glenoid surfaces ranges from 0.89–1.09. Thus, in some people, and especially those with degenerative cartilage conditions, the articular surfaces are not exactly congruent. A rather complex pattern of glenohumeral movement results from the up to 3 mm difference between the radii of curvature of the humeral head and glenoid articular surface. 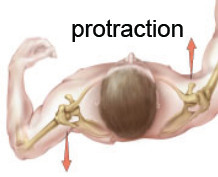 In abduction, the humeral head migrates upward. 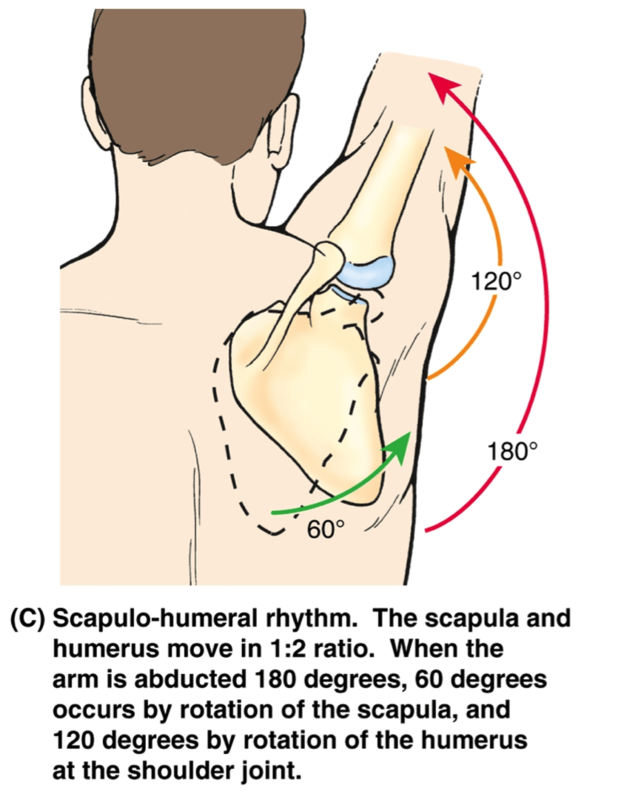 During the first 30° of arm elevation in the scapular plane the humeral head moves up by about 3 mm due to a combination of rolling and translation. Beyond the initial 30°, the humeral head displaces approximately 1 +/- 0.5 mm up or down each 30° of angular rotation. During external rotation, the humeral head displaces backward and during internal rotation forward. So during the arm cocking phase, the humeral head glides posteriorly on the glenoid fossa, but during the delivery phase it will glide anteriorly. These displacements are mainly due to differences in the curvature of the humeral head and glenoid cavity. Due to these curvature differences, the glenoidal center of rotation and the humeral head center of rotation will be different. Arm elevation is thus a combined motion of these two elementary rotations that are in opposite directions. If the glenohumeral joint was a pure ball-and-socket joint, the joint ICR would be coincident with the two elementary rotations. But it is not, and the humeral head rotates around the joint ICR. However, most all shoulder kinematics studies model the glenohumeral joint as a ball-and-socket joint to negate these differences. Because the glenohumeral joint is modeled as a ball-and-socket joint with 3 rotational DOF, the inherent problems of describing 3D rotations such as induced twist are often found in the literature for shoulder kinematics. Specifically, the reported magnitude of the axial rotation of the humerus is dependent upon the angular convention selected. There are two different ways to recognize arm abduction, frontal plane abduction and scapular plane abduction. The scapular plane is defined as the plane of the scapula in the resting position. During arm motion the scapula changes its orientation and no fixed scapular plane exists. In frontal plane abduction, the range of motion depends on the orientation of the humerus. With the humerus internally rotated, the abduction range is limited by impingement of the greater tubercle of the humerus on the acromium process and is typically between 60°-90°. With the humerus externally rotated, the range of motion increases to 90°-120°. In scapular plane abduction, the humeral rotation does not influence the range of motion. When the arm is abducted in the plane of the scapula, which is angled between 30°-45° anterior to the frontal plane, there is much less restriction to motion. The range of active abduction in this plane is on average 107°-112°. The range of motion in frontal plane abduction increases from 90°-120° when the abduction is performed passively (caused by external forces). However, this motion is difficult to separate from an accompanying scapular movement. 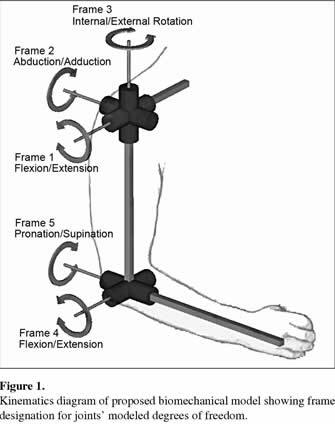 The range of motion for flexion is on average 120° for both active and passive movement. When the movement of the humerus relative to the axial skeleton is desired rather than relative to the scapula, the humerus is the end link of the following kinematic chain: trunk (sternum) -> sternoclavicular joint -> clavicle -> acromioclavicular joint -> scapula -> glenohumeral joint -> humerus. Relative to the sternum, the glenohumeral joint is located at a sphere with the clavicle as the radius. Orientation of the glenohumeral joint is defined by the position of the scapula. The main function of the scapular motion is to orient the glenoid cavity for the best humeral contact. Functionally, the scapula is part of a closed kinematic chain formed by three links (the scapula, clavicle, and trunk [sternum]) and the three joints (sternoclavicular, acromioclavicular, and scapulothoracic). Any scapular movement occurs simultaneously in the scapulothoracic and claviculoscapular articulations. Not including the humerus, the scapula only has one bony connection, with the clavicle through the acromioclavicular joint. Because the lateral clavicle moves in the sternoclavicular joint, the acromioclavicular joint moves substantially relative to the thorax. Hence, the scapula can rotate around three axes in the acromioclavicular joint and translate together with this joint in two directions. 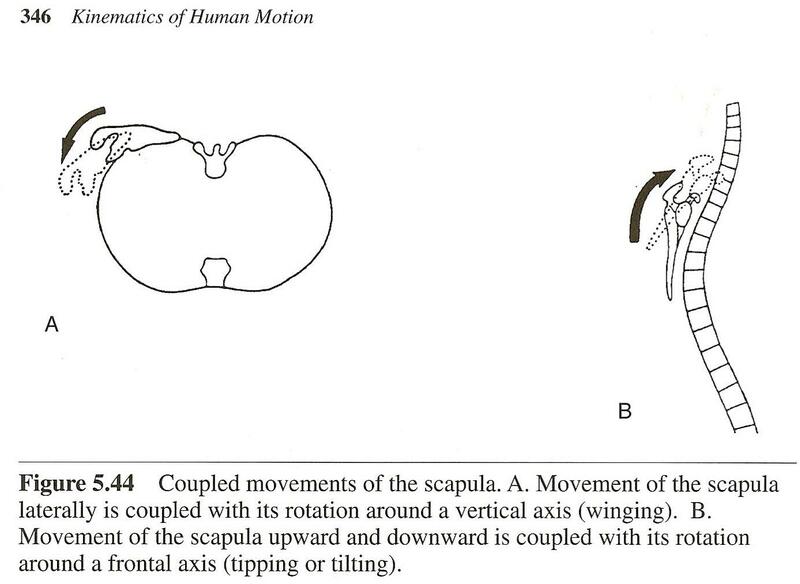 These movements are, however, coupled, and the scapula has only four, or maybe even three, DOF. The motion of the scapula over the thorax is not planar and because of that an isolated rotation or translation about an individual axis cannot be performed. For example, when the scapula glides over the rib cage in the lateromedial direction it rotates at the same time around a vertical axis (winging), and when it migrates vertically it rotates around a frontal axis (tipping or tilting). Because of this dependence, any classification of the scapula motion is not very strict. In the acromioclavicular joint, there are three angular motions: scapular rotation, winging, and tipping. The primary movement of the scapula is its upward rotation (glenoid tilts upward) and downward rotation (glenoid tilts downward) performed around an anteroposterior axis. The rotation occurs in both the acromioclavicular and scapulothoracic joints, and is often referred to as abduction-adduction. Because of the complex character of the rotation, the instantaneous center of rotation (ICR) displaces substantially. Between 0°-80° of arm elevation the ICR is near the root of the spine of the scapula, between 80°-140° the center migrates towards the acromioclavicular joint, and beyond 140° the center is at the acromioclavicular joint. Rotation of the scapula around a vertical axis is called winging. It is accompanied by the gliding of the scapula over the contour of the ribs in the scapulothoracic articulation. When this movement is performed jointly with anterior movement of the lateral end of the clavicle it is called protraction of the scapula. Protraction results in the translation of the scapula around the curved chest away from the vertebral column. The opposite movement is retraction. In a retracted position, the scapula approaches the vertebral spines with the vertebral border approximately parallel to the spinal column. Rotation of the scapula around a frontal axis is called tipping or tilting. This is essentially an internal rotation of the scapula, a movement of the inferior tip of the scapula away from the thorax. An internal rotation of the scapula, during which the superior tip of the scapula moves posteriorly, takes place when arm elevation is accompanied by external rotation of the humerus. When people shrug their shoulders, the scapula is elevated. It is depressed when people drop their shoulders. Because all of the motions of the scapula are coupled, the elevation and depression of the scapula, which are considered predominantly translator movements, are accompanied by scapular rotations. A quantitative description of scapular motion is far from simple. Scapular movement is hard to register and difficult to describe. Any movement is essentially 3D and combines translation with rotation. Rotation of the scapula around an axis, such as during tipping, changes the orientation of the other axes of rotation, i.e., the axis of winging is not vertical anymore. Hence, the classic anatomical angles are not determined flawlessly and Euler’s angles should be used to define scapular orientation. The scapular motion is not independent; it is an element of the shoulder girdle movement that allows a conscious control of the shoulder position. As a result, learning and training may influence movement pattern. This results in large differences among individual people. Anatomic peculiarities, such as chest curvature or dissimilar winging angle (ranging from 30°-45°) contribute to this variability. Because the scapula has no definite resting orientation, its attitude is defined with regard to a virtual reference position. This is a position in which the scapular plane is parallel to the frontal plane and the spine of the scapula is along the frontal axis. Note that the virtual position is physically not attainable, rather it serves only as a virtual reference position to compare against. Generally, scapular movement is described either relative to the sternum or relative to the trunk (a longitudinal axis of the sternum system is inclined to the vertical axis of the trunk by approximately 15°). A product of two transformation matrices is calculated. The first matrix defines the orientation of the clavicle relative to the sternum and thorax, and the second the orientation of the scapula with regard to the clavicle. In total 6 Euler’s angles (or 18 direction cosines) would be needed for such a calculation. Kinematically, the sternoclavicular joint functions as a ball-and-socket joint with three DOF. The movements of the clavicle are: elevation/depression (the lateral end of the clavicle moves up or down); protraction/retraction (back-to-front and front-to-back movement), and axial (anterior/posterio) rotation. 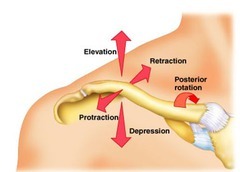 The fairly large range of clavicular motion in elevation is on average 45°, in depression it is 15°, in protraction-retraction it is 30°, and in axial rotation it is 30°-45°. During circumductory motion, the acromial end of the clavicle sweeps an ellipse with the major axis in the inferior-superior direction. The clavicle operates as a bony strut with two articulations at the ends. The clavicular motions are coupled with movements of the scapula (except during pure scapular abduction/adduction). For truly efficient movement patterns the body needs the scapula and humerus to work synergistically. The term for this is scapulohumeral rhythm. Mike Reinold says normal scapulohumeral rhythm requires a sequence of shoulder and scapular movement simultaneously. The following video provides a good animation of scapulohumeral rhythm. The shoulder complex is comprised of two individual mechanisms: (a) the shoulder girdle, consisting of the clavicle and scapula as the moving links and the sternum with the rib cage as a frame, and (b) the humerus as a moving link and the scapula and clavicle as a frame. Bone rotations should be defined relative to the virtual reference position as rotations in the global (laboratory) reference frame. Joint rotations should be defined relative to the starting position as a series of rotations in the global (laboratory) reference frame in which the proximal bone is fixed. Three DOF at the glenohumeral joint (flexion/extension, abduction/adduction, and internal/external rotation). To describe the shoulder configuration with regard to the sternum system nine Euler’s angles, three for each bone system, are necessary. In what follows, either the angles in the plane of motion or the projection angles on the reference planes are reported. During upper extremity elevation, the scapula rotates at the sternoclavicular and the acromioclavicular joints. As a result, the glenoid fossa, on which the humeral head moves, tilts upward. This concerted movement of the humerus, scapula, and the clavicle is referred to as the scapulohumeral rhythm. The rhythm becomes evident after about 30° of abduction or 60° of flexion. The initial phase of the humeral movement, during which the scapula either rotates a little or remains fixed, is called the setting phase. Beyond the setting phase, the humerus, scapula, and clavicle move conjointly. In its entirety, the ratio of glenohumeral to scapular rotation is approximately 2:1. For 180° of full arm elevation, the glenohumeral rotation contributes approximately 120°, while the scapular rotation contributes approximately 60°. Because of the existence of the setting phase, during which the scapula does not rotate, the glenohumeral-to-scapular ratio for the period when then scapula does rotate is less than the overall ratio, on average about 1.25:1. The relationship between arm elevation angle and scapular orientation is not linear. 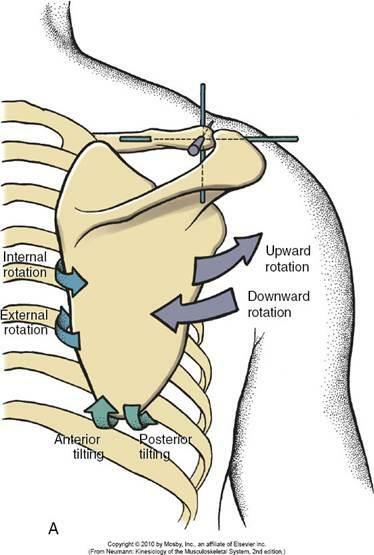 The ratio of glenohumeral rotation to scapular rotation varies throughout the range. 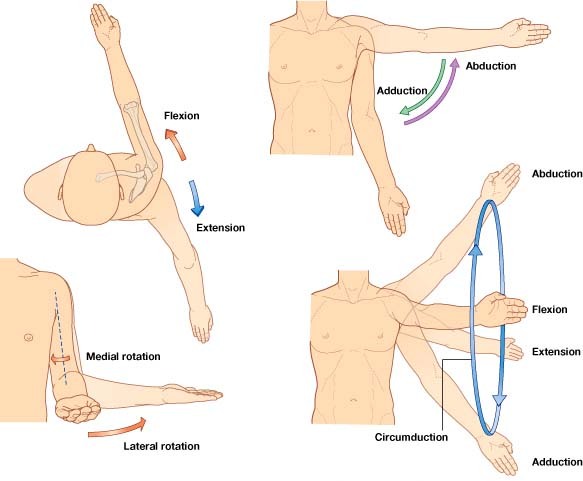 Glenohumeral rotation predominates in the beginning and at the end of arm elevation. 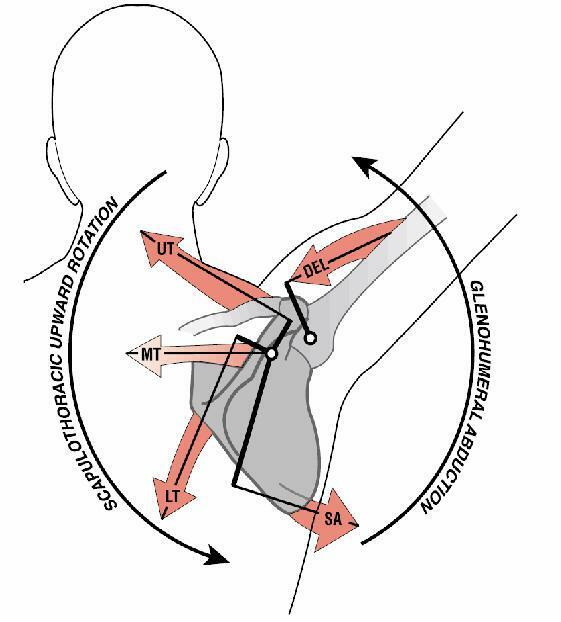 The interindividual differences in the glenohumeral-to-scapular rotation ratio are very large. The slope of the regression of the glenohumeral component on total arm abduction calculated over the whole range of motion varies from 0.5–0.75, with a mean of 0.66. 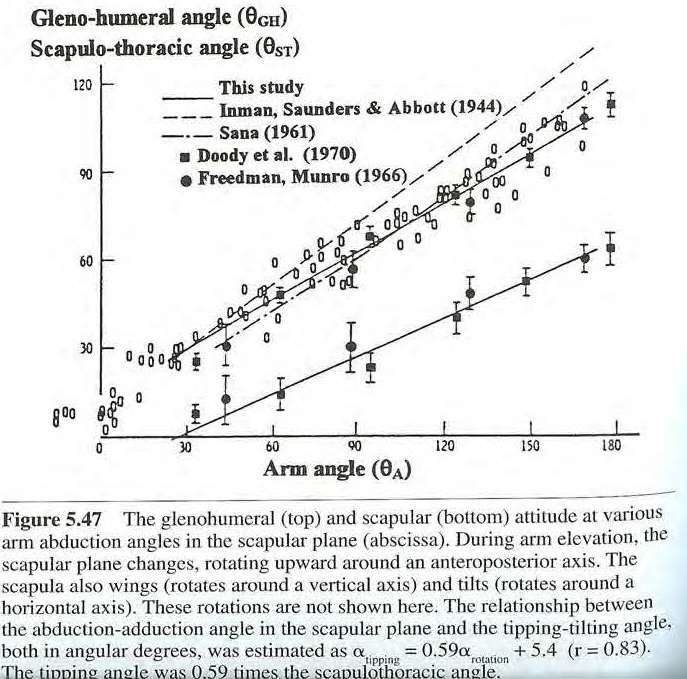 The slope 0.66 is essentially the same as the previously mentioned ratio of glenohumeral to scapular rotation 2:1. The slope does not depend on the abduction velocity and external load. For any one person, the shoulder rhythm is essentially reproducible. During arm elevation, the clavicle rotates about an anteroposterior axis at the sternoclavicular joint. The rotation results in the elevation of the acromium and lasts until the arm is elevated up to 90°-100°. 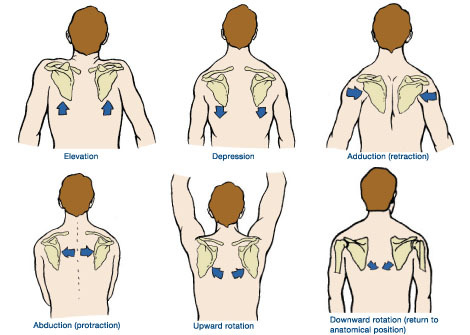 In approximate numbers, raising the arm to the horizontal involves 30° of scapular rotation, mainly due to the elevation in the sternoclavicular joint. Raising the arm from the horizontal to the vertical position involves 30° of scapular rotation produced by the acromioclavicular motion itself. Beyond the 90°-100° region, the clavicle rotates around its long axis. The superior aspect of the clavicle spins posteriorly. During the setting phase, the angle formed by the clavicle and the spine of scapula in the transverse plane increases. 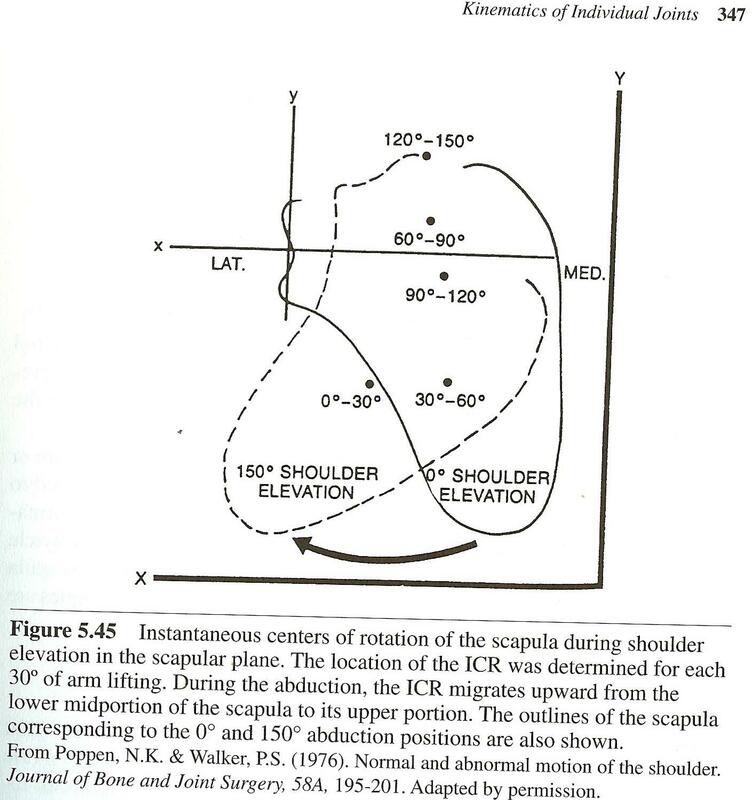 Because of the displacement of the shoulder girdle during arm movements, the ICR for the shoulder complex differs greatly from the ICR for the shoulder joint. The path of the centrode is extremely large.